It’s awesome and we love it. Are you dying for episode 3 to come out already? Yeah, we are too. And yes, we’re also hoping it’s longer than episode 2. If you’ve been too busy building your own world to check out what people have been saying about #Storymode and maybe even too busy to notice some extra details, don’t worry, we got you covered. You’re welcome! Arcade Sushi rated Minecraft Story Mode a 9 out of 10, which means they consider it to be near perfect. You got that right, Arcade Sushi! Ok, so a lot of people are complaining that episode 2 is too short. Of course, we’d love any Story Mode episode to be longer (who wants it to end?). But did you notice how things in episode 2 are based on your choices from episode one? Pretty killer. Set to be released sometime in December, we’re all on the edge of our seats to find out where our story take us. Stay tuned for our thoughts and feedback next month! We can’t wait. If you chose Jesse to be a male, the voice you’re listening to is Patton Oswalt. He was also the voice for Remy in Ratatouille and he does the voice-over in The Goldbergs (he’s the voice for the adult version of Adam Goldberg). If you decided Jesse should be female (like the guys at WIRED did), the voice you’re enjoying is Catherine Taber. She does a lot of Star Wars games, mostly as Princess Leia and Padmé Amidala. She also played April O’Neil in 2012’s Teenage Mutant Ninja Turtles: Out of the Shadows. If you don’t recognize Brian Posehn from Friends, your mom definitely will. Brian’s a self-professed fantasy SciFi geek. But he hates the new Star Wars. We’re still on the fence about this one. 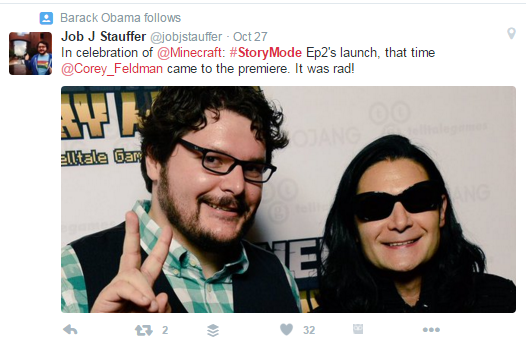 Did you know President Obama follows the Head of Creative Communications at Telltale Games, Job S Stauffer on Twitter? So, is it true? Does Barak Obama actually play Minecraft??? We might never know. But this sure is a good clue. 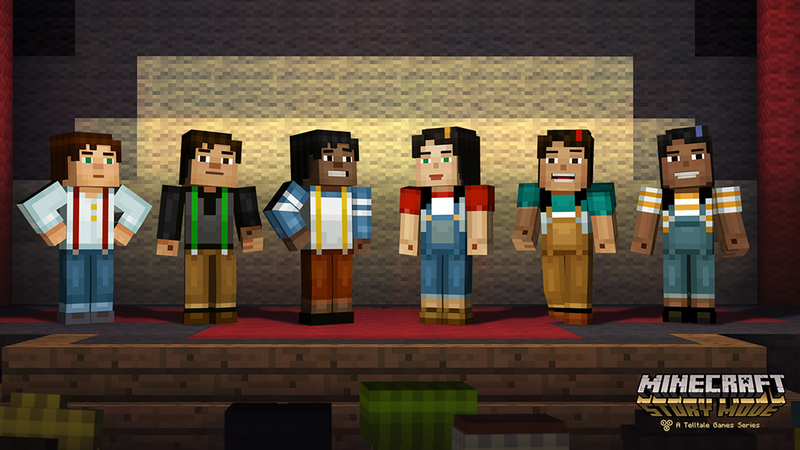 In Minecraft Story Mode Episode One, 62% of players built a treehouse to stay safe for the night and 38% of players built a ground-based hut. What did you build? 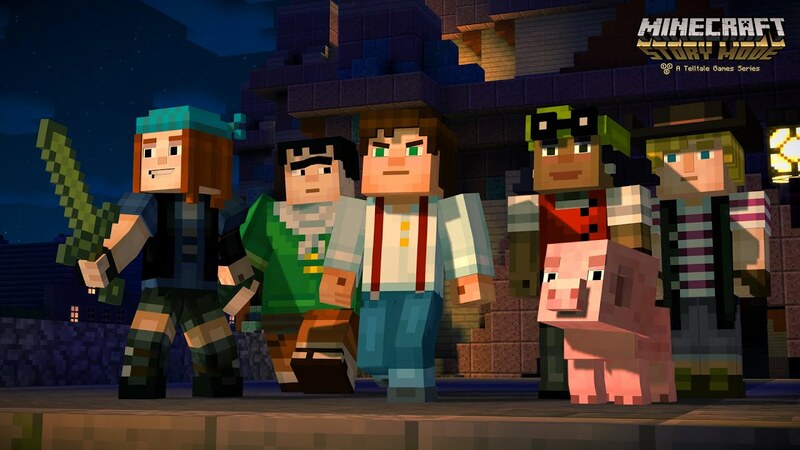 Love Minecraft Story Mode as much as we do? Get unlimited player slots, plugin/mod support, and technical support (included free!). Get the best Minecraft Server Hosting there is. Check out Bestnode and get beastly with Minecraft.